"Angels are filled with affection and Jubilus, they dance so innocently and play the strings of starlight with arrows of flames of the sun, the sound of blessing are ringing through the entire universe. begins to resonate to the string orchestra of angels with affection and jubilus." Thank you for your patience, it is the first time of the release of JINMO's string orchestration album since the release of the album "Kiss". Similar to the album "Kiss", every track in "Angels" is anything but beautiful. We have no idea how to describe this heavenly beautiful album. You know JINMO has composed very beautiful albums so far, but this album "Angels" is amazing. A clear, unclouded sound is pleasant to ears and it take us to cozy place we've never been...like heaven. Yes, it is entirely string orchestra played by angels in heaven. neither distinguished by harmonic structure nor metric structure. It is all but indisputable that sensations are superior to thoughts. and it takes our spirits so high. 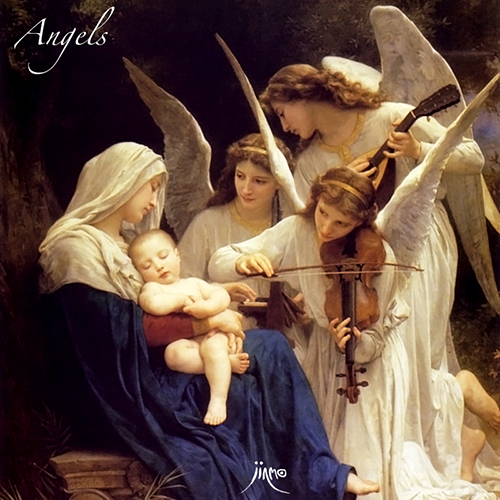 Cover picture is "Song of the Angels" (1881) by William Adolph Bouguereau, the painter in 19th century . Angels make an offering of music to the Messiah held by Our Lady. The primarily sound group in the album "Angels", is filled with joy and compassion as shown in the image of this beautiful picture, on the other hand, it also has spectacular flavors of tense atmosphere of angels shown in the Revelation or the book of Enoch. Bless yourself with beautiful sound of "Angels" at full volume. We are sure it will lead you to heaven with extra-beautiful, pleasant sound.